A young woman inside an ice cave when it partially collapsed recently, killing one, in Washington state said that within five minutes, the "absolutely stunning" scene transformed into that of a "war zone." "Everybody was happy. It was really cool. ... [Then] we heard a pop and I got really nervous and I just look up and there's, I see there's this sheet of ice coming down," said Chloe Jakubowski, 18. "I crouched down as quickly as I could and I put my hands over my head." Jakubowski was among eight in the back of the cave when the collapse happened Monday around 5 p.m. at the Big Four Ice Caves, located in the Mount Baker-Snoqualmie National Forest east of Seattle. 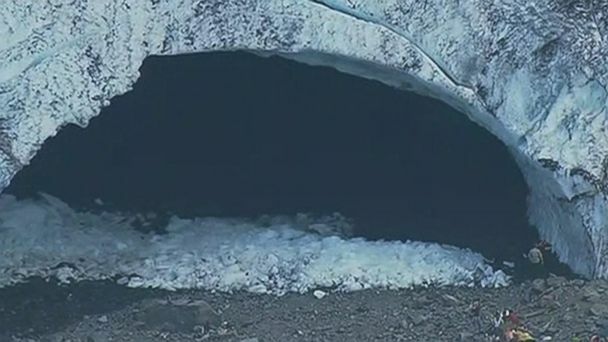 The massive ice cave is popular with hikers but in May, officials had posted warnings for people to stay out. One woman was killed and five were injured, authorities said. The person who died was located inside the cave when it collapsed, according to the Snohomish County Sheriff. Crews were having a difficult time getting to the back of the cave to recover the body of the 34-year-old woman as more ice continued to fall, making the cave extremely dangerous, officials said. Warm temperatures in recent months had made the caves unstable, said Shari Ireton, director of communications with the Snohomish County Sheriff's Office. "They're essentially a frozen-over avalanche chute sitting over a waterfall, sitting below a giant rock shoot," Ireton said. "It's incredibly dangerous." The last time someone died in the caves was 2011, authorities said. Jakubowski said today she realized just how lucky she was to escape with minor injuries. "It was really scary," she said. "I just didn't know if those were going to be my last few moments." ABC News' Kendis Gibson contributed to this report.